Smaller, but just as powerful as its progenitor, the Sound Blaster Roar 2 is a multifunctional speaker that knows how to drop the bass and fill the room with sound. It probably didn't happen this way, but I like to think the Creative Sound Blaster Roar 2, the sequel to the Sound Blaster Roar SR20 that blew me away in 2014, was conceived from a dare. While I'd like to imagine one of the sound engineers at Creative rolling up their sleeves, thrusting out their hand and grinning before accepting the odd request, I can say with 99% certainty that didn't happen. However it was conceived, though, doesn't really matter. 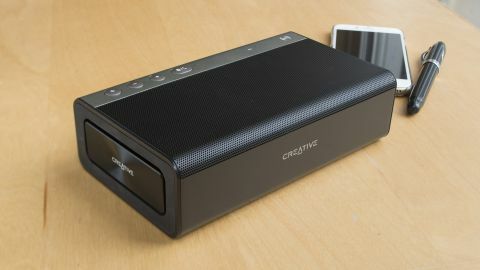 One way or another, Creative took on the challenge and delivered a modified speaker that's smaller, lighter and only slightly more expensive than the original was one year ago. Beside the reduced chassis, there's not much new to report on the Roar 2. Subtle tweaks take precedence over major refinements, but what's changed has been for the better. If the speaker's laying down, you can spot an aluminum front with a Creative logo dead center. The device provided to techradar by Creative for review is jet black and all business, though it does come in white – if that's more your style. On top, there's a grille that keeps the three drivers safe and sound, as well as a slew of control buttons that turn the speaker on and off, raise/lower the volume and pair it to your Bluetooth device. You'll also find the the NFC chip under the top right corner that you can use with any NFC-equipped cellphone for rapid pairing. Spin it left or right, and you'll find either radiator that's responsible for the excellent bass. There's a give to them, and they can be manually depressed if you push in on the sides. I often had the fear that a rogue item in my bag might jut into them, ruining any chance I had at listening to "Sail" by AWOLNATION in its full bass-heavy glory ever again. About seven trips in my bag later, however, I'm happy to report that my worst fears didn't come true. Spin it around all the way, and you'll find the rest of the controls and ports. In terms of inputs and outputs, there's an aux-in for classic 3.5mm cables, a USB port for phone charging, microUSB to charge the device itself or connect to a PC and, finally, a microSD slot that can read music from a card or record sound files to it using the microphone. Controls include your standard play/pause, forward, rewind, record, mute and shuffle switch that toggles in what order you want songs played from the SD card. There's also the Tera Bass/Roar button that's wholly unique to Sound Blaster. Push the button once, and you'll hear unbridled low-end sound or, push it twice to enable a louder all-around sound that trades some of the audio's clarity for pure volume. Both Tetra Bass and Roar are best when used sparingly. Listening to all bass, all the time comes at the cost of decent mids and highs. Meanwhile, the Roar mode fills the room while making some audio details indistinguishable in the cacophony of sound. Whether it's the soaring riffs in "God Gave Rock'n'Roll to You" from Kiss, melodic ooh's in Duck Sauce's "Barbra Streisand" or Kanye's terrifyingly powerful lyrics and sirens in "POWER," the Roar 2 takes it all in stride. The speaker delivers uncompromising audio fidelity at the highest volume levels, and while I don't find it to have the same nuanced attention to detail that high-end headphones have, this is one of the best-sounding Bluetooth speakers. The Roar is best utilized inside in a small to medium-sized open room. It has a bit too big of a sound for my small bedroom, but is an absolutely perfect fit for my average-sized living room, which is usually reserved for my Sonos Play:5. Creative covers the entire audio spectrum well, but does a particularly good job with pronounced mids. After several conversations with the development team, it's clear they're not trying to emulate Beats's uncontrollable urge for bass or chasing after highs at the expense of the rest of the system. The only time the Roar let me down was when I went into the Sound Blaster app and found that I couldn't customize the sound on the speaker, like I've done for Creative products in the past. Acoustic songs could've used a bit tweaking, and some of my favorite tracks like "I Will Wait" by Mumford & Sons comes off slightly flatter and more two-dimensional than I would like. That said, if you plan on using your PC to control the music instead of your cellphone or tablet, you'll have the complete suite of Creative's controls at your fingertips. But playing audio is only one half of the Roar's capabilities, it's a halfway decent recording device, too. Load in an SD card, hit record and you'll soon have a 192KHz recording on your hands. If you're really into recording, this could be a feasible path for podcasting, grabbing vocals for a track or, if you're up for some sound editing, a way to record an instrument. What's probably more helpful for the majority of folks, though, is its ability to act as a speakerphone that can be placed on the center of a table and used in businesses or at home. The sound quality is fair, though at one or two points a call crackled, and the person on the other end reported that I sounded "echo-y," marring the Roar 2's so-far-perfect playback record. My other qualm with the Roar 2 is that the 6,000mAH battery is big, but not as big as some of its competitors like, for example, the JBL Xtreme, which sports a 10,000mAH unit. Creative says to expect around eight hours of battery life from the Roar 2, which after a week of testing and only recharging it once, sounds right. The Sound Blaster Roar 2 is a marked improvement on its predecessor. It's lighter and 20% smaller, but no less powerful. It has a pretty stellar sound, and while it couldn't fill an auditorium like some 7.1 systems can, the Roar 2 puts out a respectable amount of noise. It's also one of the best-looking speakers around. Both the jet black model and all-white one have a refined simplicity to them that totally trumps other speakers' childish, sometimes gaudy exteriors. Overall, it's a fine buy for someone looking to add another speaker to the living room, or a Bluetooth-enabled music player in the bedroom or bathroom. Its battery life could use some improvement (I don't know anyone who would turn down a sizeable 10,000mAH battery), but ultimately Creative packs two features – Roar and Tetra Bass – that give it an edge on the competition. If you've got the cash in hand and are looking for a refined Bluetooth speaker with a balanced sound, a fair bit of volume and a brilliant design, you've just found it.